Pictured with sponsor, event chair Liz Earle and runner up Michael Le Page. Pictured with winner Roisin Dervish-O'Kane, fellow runner-up Joanna Moorfield, sponsor, event chair, Liz Earle. 2017: Freelance of the Year, MJA Awards, June 2017 - for a portfolio of work published by Mosaic, the Daily Mail and the BMJ. 2009: Best Freelance Feature, Guild of Healthwriters. Winner Guild of Health Writers 2018 award, Lifestyle section. 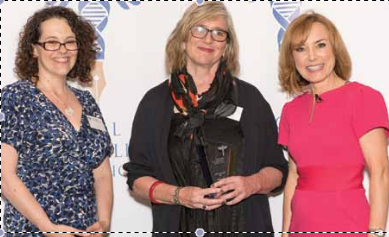 Runner up Guild of Health Writers 2018 award, Women's Health. The judges said Jane’s “engaging journalism” illustrated the ability and skills needed to adapt to very different audiences. It's one of the most thoughtful, dramatic, character-driven approaches to both unique and universal aspects of the crisis we're all invested in addressing - Sarah Kessler of Lifebox on Mosaic Science article on pulse oximetry in Mongolia, February 2017. Jane came up with brilliant headline-grabbing research. Her writing was engaging and accurate and met our tight deadlines - Kim Davies, Therefore Publishing.